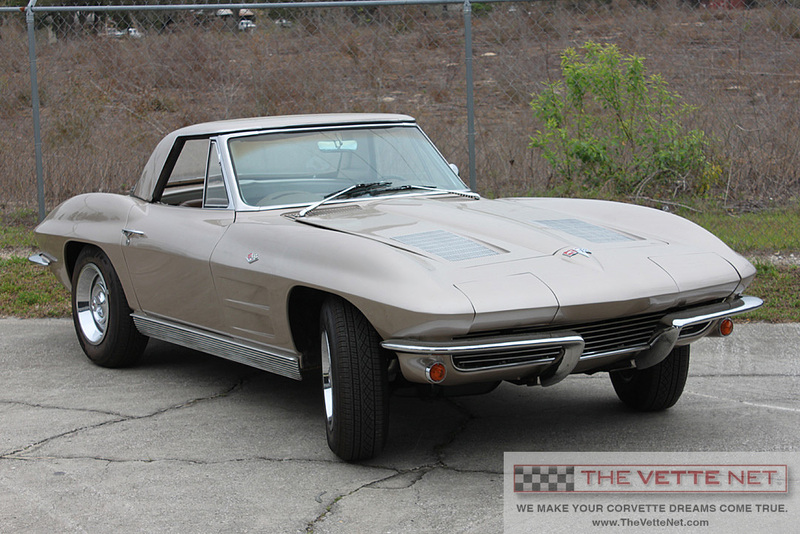 GENERAL INFORMATION: This very desirable Saddle Tan 1963 Corvette convertible is located in FLORIDA. THE VETTE NET is honored to show you this classic Sting Ray convertible. We are a professional Corvette brokerage network and proud Lifetime Business Member of the National Corvette Museum. Thanks for stopping by. The owner of this 1963 Corvette convertible has noted the engine is not original. It appears to be a 1968 Chevrolet 327 small block. It runs very strong and does not smoke at idle or under acceleration. The VIN indicates this 1963 convertible is an early model (assembly date). All body panels have the correct bonding strips and the panels appear to be original. The Saddle Tan paint has a couple of minor chips from driving (maybe 4 total on the front end), but overall the paint is in good condition. There is a small (2”) paint crack by the hood emblem peak. The owner states that is the worst spot on the car. There is a windshield wiper mark on the passenger’s side and the owner says it will buff out. New correct style wipers and arms have been recently installed (following the photography). The Saddle interior and carpeting was replaced in 2014. The passenger seat has 2 small nicks but everything else is in good condition. The dash covering(s) is original and still soft. No cracks or dry rot. As you will notice, the center part of dash is painted black and not covered. The owner reports other than the clock all gauges and switches function as you would expect. The radio is an old aftermarket tape deck. The doors and crank windows open and close. This Corvette comes with a hardtop that was painted with the car. It has been refreshed but the Plexiglass windows appear to be original and dated. The rear window does have some scratches. The frame appears solid with no visible evidence of rust through. The frame end caps were replaced with correct repair pieces. SPECIFICATIONS/OPTIONS/Features: This 1963 Corvette convertible was ordered with a 300hp engine as indicated by the tach redline. It has a Muncie 4-speed but the owner is not sure if it is the original. The original radio has been replaced (a long time ago) with an aftermarket model with tape deck. The hardtop does come with the car and is in good condition. The tan soft top is like new. CONDITION RATING: (Using a 10-high scale): The owner rates the overall condition of this Corvette as 7+. All the normal maintenance has been done and this Corvette is ready for you to enjoy. Recent mechanical/cosmetic work includes…..Starter, alternator, clutch, carb, intake, belts and hoses, brake lines and master cylinder, fuel tank and sender, rear wiring harness/engine wiring harness, exhaust system, tires and rally wheels with trim rings, parking lights, grille and surround molding, steering wheel, door handles, emblems, side and rear view mirrors, and weatherstripping…..It’s all new! Do you have a Corvette For Sale? If yes, you may want to take advantage of our FREE and unique marketing program. There is no upfront fee and no exclusivity. Please visit www.TheVetteNet.com and click on the ‘LIST WITH US” page. There you can list your Corvette for sale using our highly regarded Corvette broker service. Thank you.